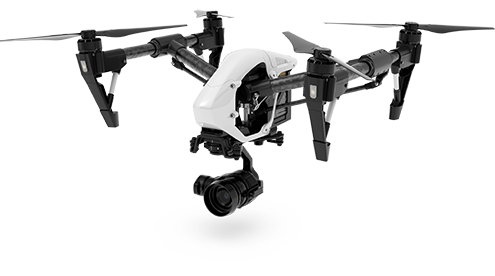 We are happy to announce that we have added the DJI Inspire 2 to our ever-evolving fleet of drones here at DroneBoy. I thought this would be a good time to reflect on how far this iconic drone has come before I delve into its awesome new features and industrial design on our new model. Ever since the first Inspire 1 X3 drone / camera package came on the market just over two years ago it immediately became one of our most popular systems for film and photography jobs. The image quality VS size VS cost to fly equation was just about right for all but the most discerning productions. Our Pilots and Camera Operators fell in love with the Inspire because it gave us all the dual control features that are necessary to create truly cinematic shots where the drone can fly in one direction and the camera can point somewhere else entirely (dual control – Yes!). Also, it gave us the ability to adjust all the camera functions from the linked ground station down below. Finally – full control in a plug and play package! No more hefting multiple flight cases, charging systems, transmitters, various monitors and video downlink solutions just for a simple drone shot… Hooray! However, at the end of the day the Inspire 1 X3 had a camera that was definitely better than the lower class Phantom but not production grade and that would simply not do. 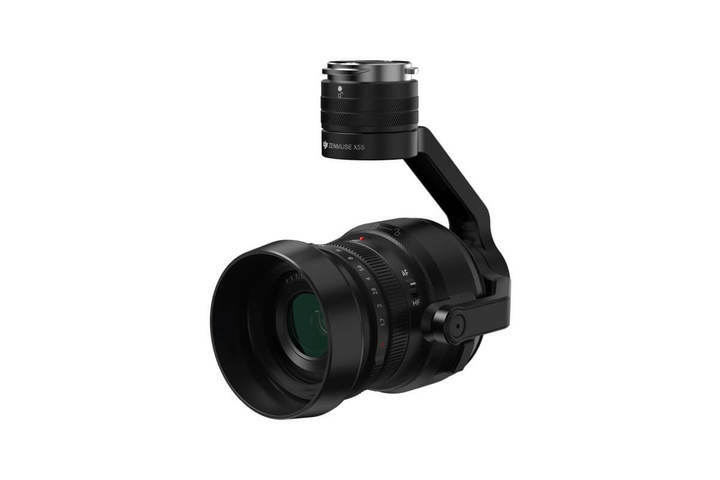 DJI quickly fixed this with the release of the Inspire 1 PRO which had a much better camera – the X5 with interchangeable micro 4/3rds lenses and a 16MP sensor. This was DJI’s first “real camera” as far as I can tell and it was pretty great. The improved X5 camera gave us the ability to offer productions different lens configurations (12mm, 15mm & 45mm) and this got us away from most of the distortion problems of the original X3. DJI loves to solve our problems (and sell us new drones to replace the ones we bought six months earlier) and they quickly offered up the Inspire 1 X5R. The “R” stood for RAW. This machine could do everything the X5 did with the addition of a new SSD drive that would reportedly record image data at up to 2.4Gb/S to the new proprietary SSD cards. No more bottleneck – hooray! Also, this unit could record 12 bit Cinema DNG Raw files and Apple ProRes video files. Finally, we had the high quality image maintained through our entire workflow from lens to sensor to SSD card to the final delivery on screen with no huge compression required. Framerate topped out at 30FPS in 4K but the image quality that we got off this system was astounding. On professional productions our Cinema DNG shots were often being cut right in alongside Red Dragon and ARRI Alexa footage and, unless you knew that it was our shots were recorded on a different camera, anyone but the best colorist could never tell the difference. All this in a drone that weighed 3.4kg! 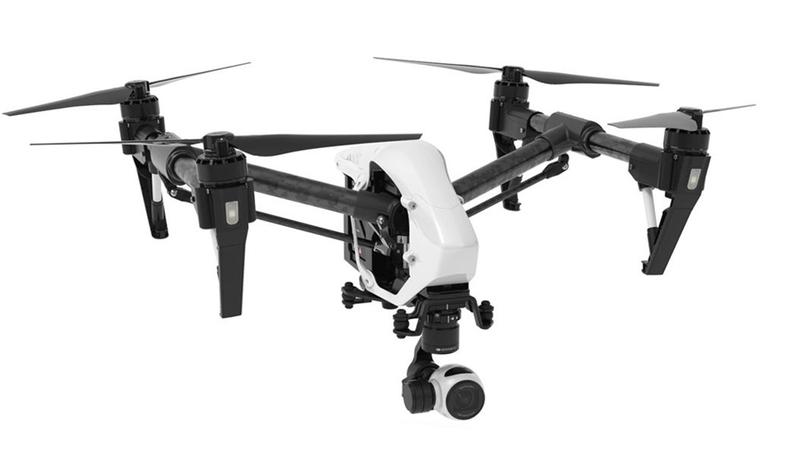 Fast forward to the end of 2016 and the unveiling of the all new Inspire 2 (I2) from DJI. Drone technology appears to be increasing at an even more accelerated rate than the famous Moore’s Law which states that “that the number of transistors in a dense integrated circuit doubles approximately every two years” (things get twice as good every two years). This is definitely the case with everything coming from DJI, particularly the Inspire class. In short, the I2 is AWESOME! 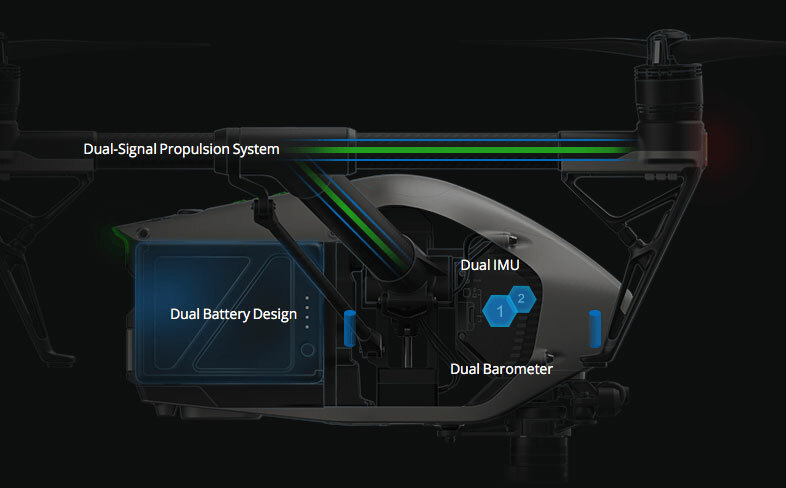 This drone has the new X5S camera system and CineCore 2.0 where the image processing systems are inside the drone and not dangling on the bottom just above the camera and gimbal. The camera sensor has been increased to 20.8MP and this allows it to record at up to 5.2K in RAW and ProRes. Some say why record any higher than 4K and here is my answer – In any professional video production image quality, bit depth and resolution is king! Capturing the very best image possible is why we are flying these machines in the first place. The higher the resolution that you can record the more room you have to move laterally in post production. Particularly when shooting with a drone where shots are moving fast and furious – framing are not always perfect and often a little post stabilization will be required. Now we have that extra buffer of resolution in the original footage and the final output can still be spectacular 4K. The I2 supports 60FPS for offspeed video (slow motion in possible post) and it can record ProRes natively to the SSD card with the addition of the licensing software. On the stills side it can record up to 20FPS of raw images. Awesome! The I2 has a new and improved SSD card that allows for even faster write speeds and, DJI fixed the terrible read speeds that we saw on the I1 SSD cards. Nice work guys! Of course, the I2 has all the sense and avoid and terrain detection sensors and systems that were recently revealed on the Phantom 4 units. 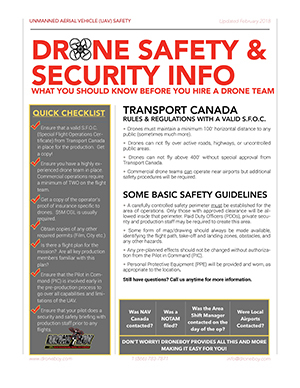 This can be incredibly handy when flying around film sets which are always strewn with obstacles. It also has the spiffy Intelligent Flight Modes including Spotlight Pro which uses the camera to visually recognize your subject and keep the camera focused on that while the pilot is free to fly where he or she likes. This is a HUGE help to single operator missions! The I2 can fly at speeds up to 94 km/h which is insane! It also has has a second 2 axis FPV (first person view) camera for the Pilot. Now that Pilot can see where he or she is flying while the Camera Operator can view the hero camera feed on their screen. Very nice! This is a very welcomed feature. There are all new “broadcast modes” for output to live TV as well as the ability to reportedly fly up to 7km away which we would never do because that would be too scary and that would certainly put us beyond visual line of sight (BVLOS) which is currently forbidden here in Canada. Overall reliability has increased by doubling up all mission critical systems and sensors as well. The I2 has dual batteries, IMUs and barometers as well as an onboard propulsion system that supports PWM and serial data for redundancy. A real nice new feature for us drone operators up here in Canada is the heated batteries that can operate at temperatures down to -20C. Now we will be able to operate in all but the coldest conditions which will be a huge advantage. All in all we are very impressed with the I2 out of the box and on our first flight tests. We are looking forward to battle testing our units out in the real world on film and TV projects this coming season. I will let you know how it goes.